Canadian photographer Paul Nicklen has tonight been crowned Veolia Environnement Wildlife Photographer of the Year with an underwater image of emperor penguins, hailed by judges as u2018spectacularu2019. Winner. This was the image Paul had been so hoping to get: a sunlit mass of emperor penguins charging upwards, leaving in their wake a crisscross of bubble trails. The location was near the emperor colony at the edge of the frozen area of the Ross Sea, Antarctica. It was into the only likely exit hole that he lowered himself. He then had to wait for the return of the penguins, crops full of icefish for their chicks. Paul locked his legs under the lip of the ice so he could remain motionless, breathing through a snorkel so as not to spook the penguins when they arrived. Then it came: a blast of birds from the depths. They were so fast that, with frozen fingers, framing and focus had to be instinctive. ‘It was a fantastic sight’, says Paul, ‘as hundreds launched themselves out of the water and onto the ice above me’ – a moment that I felt incredibly fortunate to witness and one I’ll never forget. Paul’s winning photo, entitled ‘Bubble-jetting emperors’, triumphed over 48,000 entries and secured the photographer a £10,000 cash prize. Paul, who has specialised in photographing polar regions since 1995, captured his winning image in the Ross Sea, Antarctica. The photographer told contest organisers how he stayed motionless, with his legs ‘locked under the ice’, waiting for the penguins to appear. David Doubilet, an underwater photographer and one of the competition judges, said Paul’s photo depicts the ‘perfectly organised, infinite chaos’ of the penguin world. ‘This image draws us in for a glimpse of the emperor penguin’s private world at the end of the earth,’ he added. Paul Nicklen’s images have been published in magazines including National Geographic. Meanwhile, UK teenager Owen Hearn bagged the Veolia Environnement Young Wildlife Photographer title – along with £1,000 and a photo masterclass – with a picture of a red kite captured on his grandparents’ farm. 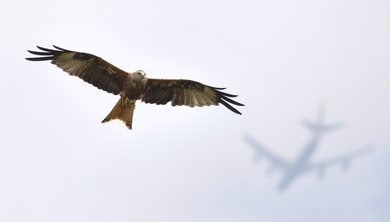 ‘This shot is especially symbolic as this photo was taken on the site originally chosen for London’s third airport in the late 1960s, when red kites faced extinction,’ said a spokeswoman for the Natural History Museum which – along with BBC Worldwide – owns the Veolia Environnement Wildlife Photographer contest. The best 100 images from the Veolia Wildlife Photographer of the Year contest go on show at the Natural History Museum in London from 19 October 2012–3 March 2013. As part of their prizes the overall winners also received a computer monitor.